A Caribbean cruise is the perfect kind of vacation for people who want to sit back, relax, and rest. All you have to do is climb on board the cruise ship and let the crew do the rest. They’ll provide all the food, amenities, and services you could need while dropping you off at multiple ports around the Caribbean Sea, giving you access to a long list of premier vacation destinations. And if you’re planning a Caribbean cruise, the Bahamas are a must-visit location. With over 700 islands and cays to be explored, the Bahamas is one of the most incredible destinations in the Caribbean, and the very best way to experience this country is by cruise ship. Lots of Caribbean cruises stop off at the Bahamas, with many of them setting off from Florida port cities like Miami or Fort Lauderdale. The cruise ships provide all the luxury and comfort you need to enjoy your journey, while also stopping off at the best beaches and hottest spots all around the Bahamas. If you’re looking to book a spot on board one of the best cruises from Florida to the Bahamas, there are a lot of great options to choose from. Cruises of various lengths can be booked, with most tending to last between two and five nights in total, with a range of companies including Celebrity Cruises, Carnival, Norwegian Cruise Line, Royal Caribbean, and more. Read on to learn all about the best cruises between Florida and the Bahamas. You'll be enjoying the amenities and facilities of the Carnival Elation for this 5 Night Bahamas cruise. This is a good option for people on the Pacific Coast of the Sunshine State as this Florida to Bahamas cruise leaves from Jacksonville. It stops off at both Half Moon Cay and Nassau in the Bahamas, giving you a great taste of island life. Guests will be able to relax on the soft white sands at Half Moon Cay before enjoying some lively Caribbean life in Nassau. As this is a 5-day cruise, you’ll have plenty of time at each location so don’t have to worry about feeling rushed. If you're looking for a short and sweet Caribbean cruise from Florida, this 2 Night Bahamas tour on Celebrity Cruises' Silhouette is a good option. It leaves from Fort Lauderdale and heads straight down to the Bahamas' capital city of Nassau, where you can really enjoy an authentic slice of Bahaman life before heading home. This is definitely one of the cheapest cruises from Florida to the Bahamas, costing around $200 per person for the whole trip, and it’s the perfect option for folks who just want a nice weekend getaway. Climb on board the 'Mariner of the Seas' with Royal Caribbean's 4 Night Bahamas cruise, departing from Miami in Florida and stopping off at both Cococay and Nassau. Cococay is an exclusive private island resort where travelers can swim, sunbathe, snorkel, and really relax, while Nassau is the heart of the Bahamas, home to a large percentage of the island's population and a great place to enjoy some local cuisine and culture. If you want a full Bahamas package in a relatively short amount of time and really want to make the most of each day, this 4 Night Bahamas cruise from Norwegian Cruise Line could be the right option for you. It's a great price, with rooms available for just $50 a night, and leaves Miami to stop off at three separate locations around the Bahamas: Freeport, Nassau, and Great Stirrup Cay. This cruise really lets you see a full and authentic slice of Caribbean life, and Great Stirrup Cay is an especially exciting private island where guest can really kick back and relax. 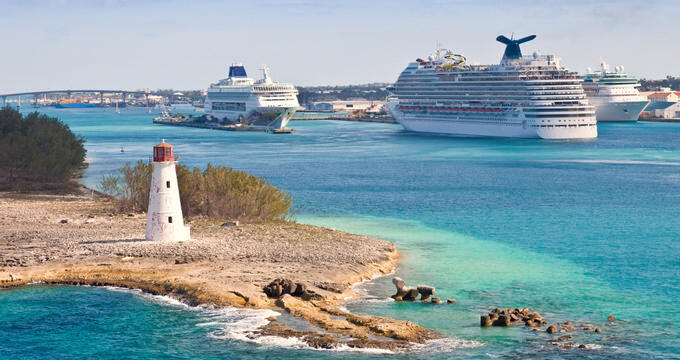 Guests will be enchanted every step of the way on this 4 Night Bahamas with Carnival. The cruise begins at Port Canaveral, which is easily accessible from Orlando, the heart of Florida, and sets off for two stops over a 4-day period. The cruise calls at the private island location of Princess Cays, before heading on to Freeport and Grand Bahama Island. Prices start at around $65 per night for the simplest rooms, with oceanview rooms and suites also available at an extra cost.